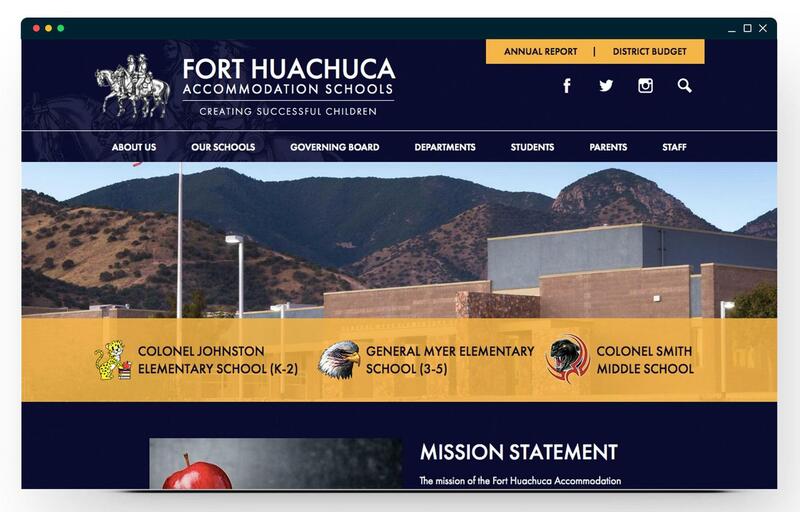 Fort Huachuca Accommodation School District is Edlio's site of the week! This outstanding site has an easy to navigate design that shows off the schools’ beautiful environment and impressive statistics. Our team loves how each school site makes use of the same district format but adjusts the colors to be unique. We think this is a great way to show connectedness throughout the community! The homepage is also packed with great quick links and buttons to make finding important information like the Annual Report a lot easier. Our team also loves how media is organized at the bottom of the page as it helps reach the whole education community without taking away from the beauty of the site! Lastly, although simple, we really appreciate how Fort Huachuca Schools chose a design that makes all text very easy to read due to coloring, spacing, and font choice. This helps make content on the site accessible to all while also easing the stress of visitors who are searching for something specific!